Due to my love for thrift shopping, it's a rarity that I shop at retail stores unless I have a particular garment in mind or stumble upon a great sale. Last Friday, I found a great online sale thanks to Stylish Curves. You may have seen my excitement on Facebook. Although it's unfortunate that the plus size fashion community is losing the online store eloquii, it's nice to get high quality items for a low cost. On Friday, Stylish Curves announced a coupon code that allowed you to save an EXTRA 70% off already low prices on eloquii garments. I rushed over to the site and ordered seven pieces. I got seven pieces for $31.94. I saved almost $400! Unfortunately, some of the items are now sold out; however, many are still available. Although the promotional code I used at the time is now expired, there are still great sales going on! Have you checked out the sale? What did you buy? Girl...I have to say thanks again! I can't believe this sale! I'm so ready for my stuff to some in the mail. 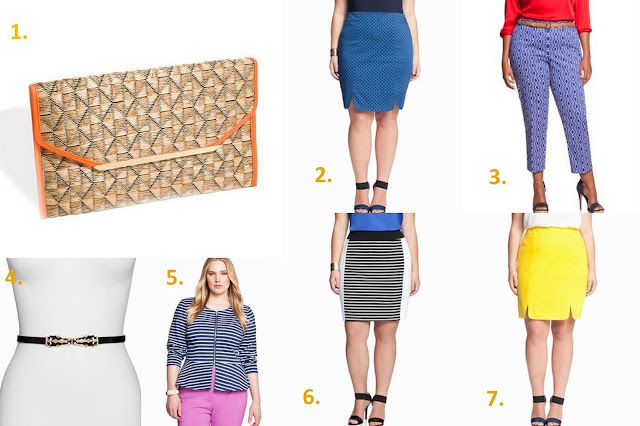 We should do a post on how we styled that blue skirt since I got that one too! What do you think about that? Let me know! I saw everyone going crazy over that sale, then I saw major disapointment when the code was yanked. I am glad you ladies took advantage when you did! Great haul. Ugg I'm mad the code expired. I want that yellow skirt!! GREAT HAUL! I love a discount! Girl... I was shocked when I saw someone post it on Facebook. I just couldn't believe it! Thanks for stopping by Shea! Great purchases! I love the yellow skirt and ankle pant. Can't wait to see how you style these pieces!